Nvidia is bringing supercomputer-class performance to its $192 Jetson TK1 computer, which is targeted at embedded devices but could be used as a Linux-based gaming PC. The TK1 is an uncased board with all the major components on it, much like the popular Raspberry Pi. But the computer offers 300 gigaflops of performance, and Nvidia said it could be used as a PC for games supporting ARM processors and the Linux OS. The performance comes through 192 graphics cores based on Nvidia’s Kepler architecture, similar to GPUs used in the world’s second-fastest supercomputer called Titan, which delivers peak performance between 17.6 petaflops and 27.1 petaflops, according to Top500. 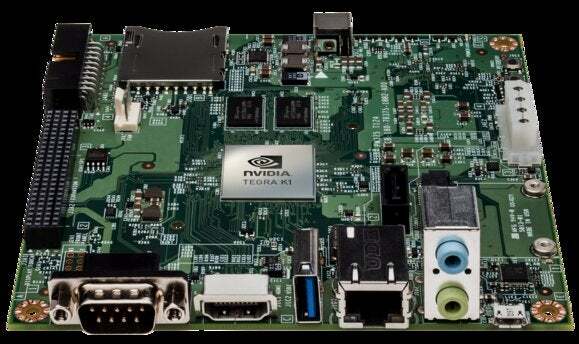 The board can be used to develop prototype devices and test applications, such as in-car infotainment, robots with vision, surveillance, or medical devices that need real-time image processing, said Jesse Clayton, the Jetson TK1 product manager. The TK1 could also be a gaming PC, though it could take some work to port games. Nvidia offers a version of Linux based on Ubuntu 14.04 for the board, and most ARM-based games are for mobile devices and written for the Android OS. “It behaves like a big GPU. If you wanted to develop an ARM-Linux game, you can,” Clayton said. The TK1 has a Tegra K1 processor based on the ARM Cortex-A15 CPU design, which is used in some Samsung Galaxy S5 smartphone models. By comparison, low-cost boards like Raspberry Pi and BeagleBone use ARM cores based on older CPU architectures. This is the first product shipped by Nvidia with K1, which was announced in January and will be in mobile devices starting in the second half of this year. The K1, which will come in 32-bit and 64-bit variants, succeeds Tegra 4, used in tablets from companies such as Hewlett-Packard and Asustek. The TK1 board has a 32-bit version of K1. Clayton declined to comment about whether a 64-bit version of the board would be released. Embedded devices may be the focus for TK1, but it could be possible to write mobile applications for upcoming K1 smartphones and tablets, said Nathan Brookwood, principal analyst for Insight 64. The board would, however, need to run Android, and the boot and processor features point to support for the mobile OS. Nvidia’s Clayton said it may be possible to load Android, though the board is designed to work with Linux. The TK1 also supports CUDA 6, which provides the underlying parallel programming tools so coders can off-load processing from CPUs to GPUs, which are faster for technical and graphics applications. Balancing processing between GPUs and CPUs can make devices more power efficient, Insight 64’s Brookwood said. CUDA is largely used via PC or server graphics cards, but Nvidia is pushing parallel processing to mobile devices and smaller electronics. The TK1 is square, measuring 127 millimeters wide by 127 millimeters long. It has 2GB of RAM and 16GB eMMC memory. Connector ports include mini PCI-Express, SD/MMC, USB 3.0, USB 2.0, HDMI, RS232, SATA and Gigabit ethernet. The expansion ports are GPIOs, UART and CSI-2, on which cameras can be attached. The board is available through Nvidia’s website, Newegg and Microcenter.